January 17, 2019 - I have spent a very stimulating and productive week in India, traveling along with the Shingal family who established the Mira & Ajay Shingal Center for Dharma Studies at the GTU. We were privileged to experience the ISKCON Govardhan Eco-Village (GEV) over the course of last weekend. GEV won the UN WTO Award in 2017 for Innovation in Sustainable Tourism. The cutting-edge sustainability technology, the organic farming methods, the educational programs, and the beautiful Hindu temples and gardens create a unique environment for fusing deep religious wisdom and practice with a contemporary, comfortable retreat center. 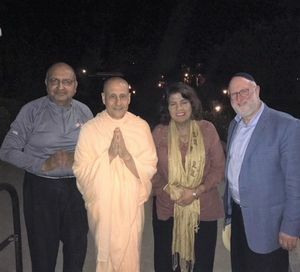 The positive impact on the local villages is most impressive and we were honored to have an intimate conversation with the visionary religious leader, Radhanath Swami, about his goals for eco-village. We concluded our visit with discussions about the potential for a jointly sponsored conference on religious perspectives on sustainability that would take place at the eco-village in 2021. We then traveled to the holy Hindu city of Varanasi where we visited many important temples and witnessed religious ceremonies on the banks of the Ganges river. Varanasi is a fascinating religious and cultural center and I was honored to accompany the Shingals on their religious pilgrimage to Varanasi. The explanations, translations and narrations the Shingals provided me was an invaluable insight into the Hindu religious and cultural life of India. They gave me a personal portal through which to enter the tapestry of stories, ideas and practices of this diverse and robust religious culture. The intense religious devotion that is evidenced around nearly every corner and alleyway of this historic city is captivating and I was mesmerized by the sights, sounds and smells of this colorful place. We visited the Baranas Hindu University and met with UNESCO Chair Professor Priyankar Upadhyaya, the director of the Centre for Peace Research. 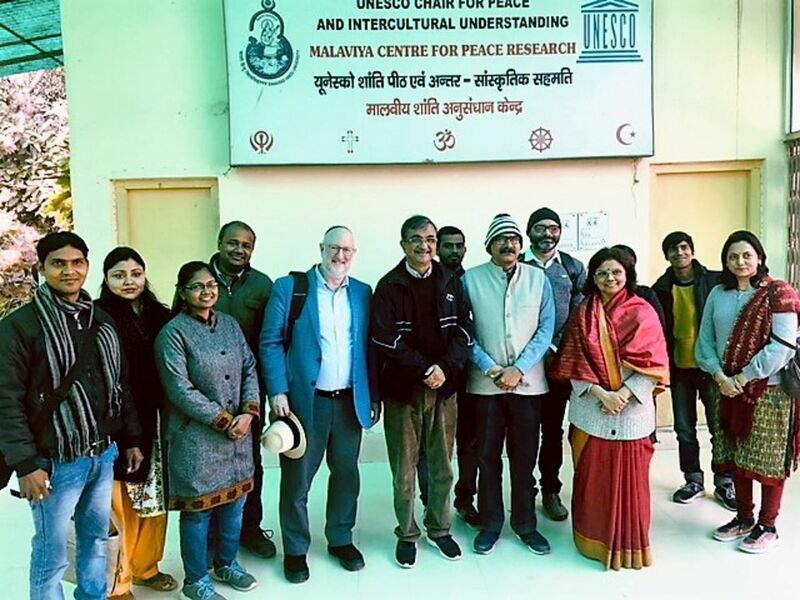 We had a broad ranging conversation and exploration of possible collaborations between GTU and BHU, which concluded with a presentation and discussion with researchers at the Centre. Yesterday, we visited Sarnath, an important historic and religious site for Buddhism just a short ride from Varanasi. Sarnath is said to be the first place where the Buddha first shared his wisdom with his disciples. We went to the archaeological museum in Sarnath and toured the holy Buddhist sites there among Buddhist monks and tourists. On the way we drove through predominantly Muslim neighborhoods on a day that revealed the religious diversity and fervor of India. Today, I am flying to Hong Kong for a meeting with leaders at the Divinity School of the Chinese University of Hong Kong. I will be giving a talk on Jewish-Christian relations and discussing ideas for exchange programs between the Divinity School at CUHK and GTU. Afterward, I will celebrate the Jewish Sabbath at a community synagogue in Hong Kong. My travels have opened me to new religious worlds, and I intend to build upon the relationships I have formed and the new knowledge I have gained to advance GTU’s interreligious mission.